It has been announced that Jet Aviation has signed a binding agreement to acquire Hawker Pacific for US$250 million. Commenting on the deal, Rob Smith, president of Jet Aviation commented: “The acquisition of Hawker Pacific represents a significant step in expanding our footprint, capability and customer offer across Asia Pacific and the Middle East. Jet Aviation is a Basel-based business aviation services company and a wholly owned subsidiary of General Dynamics, employing over 4,000 staff in 30 airports throughout North and South America, Europe, the Middle East and Asia. The company is involved in aircraft maintenance, completions and refurbishment, engineering, fixed-base operations, along with aircraft management, charter services. It’s U.S. and European charter divisions operate a combined fleet of over 250 aircraft. Hawker Pacific is the market leader in integrated civil and military aerospace sales and product support in the Asia Pacific and Middle East. It operates established businesses in Australia, New Zealand, Singapore, Malaysia, Philippines, China and the United Arab Emirates. It supports a wide range of fixed wing aircraft and helicopters for corporate, charter, defence and special mission operators. With consolidated earnings after taxes at around €155m, Munich Airport achieved the best result in its history in 2017. The Group again achieved a year-on-year increase of €100m in annual revenues to around €1.5bn – thanks in large part to a substantial 5.5% rise in total passengers to 44.6 million. The airport's strong economic performance also paid off for the neighboring communities, which will again take in business tax revenues of €35m. In view of the record figures, Dr. Michael Kerkloh, the President and CEO of Munich Airport, is confident that the company is well prepared for the challenges that lie ahead: "This ensures that Munich Airport will be able to make the necessary investments to handle its future tasks with its own financial resources." Kerkloh's outlook at today's annual press conference in Munich: "All the signs point to a continuation of our very satisfactory performance, so that we fully expect to report earnings at around the same level for 2018." A look at the current traffic trends in the recently launched summer timetable period confirms this assessment. 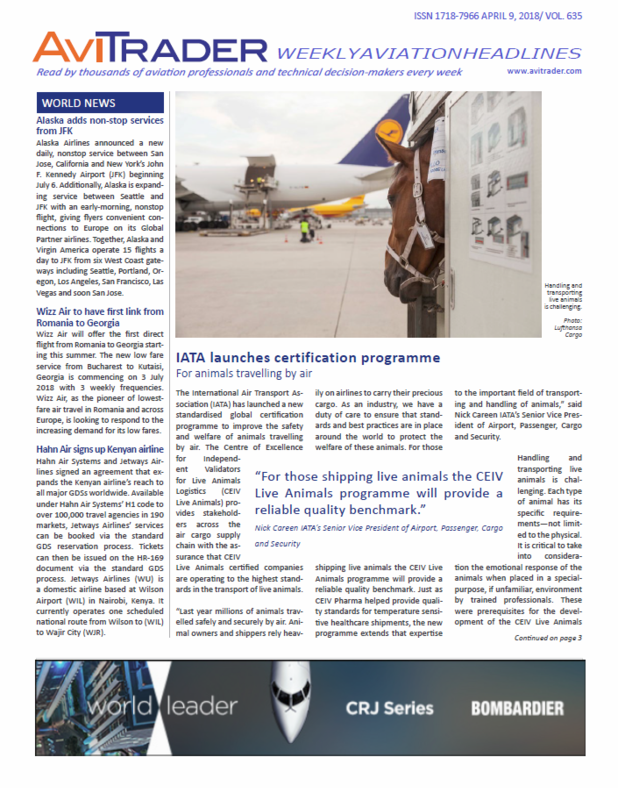 With five Lufthansa Airbus A 380 aircraft now stationed in Munich, the Bavarian hub has become just the fourth European airport – after London, Paris and Frankfurt – to serve as a home base for the world's largest passenger aircraft. Lufthansa will operate daily services to Los Angeles, Hong Kong and Beijing with the superjumbo. In addition, the German carrier has added four plans from the Airbus A320 to its Munich fleet for medium-haul flights. This has further improved the connectivity of the Munich hub. Boeing and Qatar Airways have signed a letter of intent to purchase five 777 Freighters. When the purchase is finalized, it will be posted to Boeing's Orders and Deliveries website. MTU Maintenance Canada and Lockheed Martin have signed two contracts covering the maintenance, repair and overhaul of CF6-50C2 engines as well as accessory repair for the engines. Combined, the contracts have a value of around US$135m. These contracts support Lockheed Martin in their maintenance program for KC-10 Extender refuelling tanker aircraft program on behalf of the U.S. Air Force (USAF). MTU Maintenance Canada is the MTU Maintenance group’s center of excellence for engine MRO in military applications in North America. Headquartered in Bethesda, Maryland, United States, Lockheed Martin is a global security and aerospace company that employs approximately 100,000 people worldwide. The company is principally engaged in the research, design, development, manufacture, integration and sustainment of advanced technology systems, products and services. ATR and Mandarin Airlines, a regional subsidiary of Taiwan’s flag carrier China Airlines, have signed a Global Maintenance Agreement (GMA). This comprehensive support package covers the repair, overhaul and pooling services of Line Replaceable Units, along with a door-to-door service through which ATR is providing transportation of spares to the airline’s facilities. This GMA covers the entire ATR fleet of the Taiwanese carrier, consisting of nine ATR 72-600s. Turboprop manufacturer ATR hereby reaches a key milestone of more than 300 in-service aircraft under GMAs. Through ATR’s flagship maintenance offer, Mandarin Airlines will benefit from an a la carte pay-by-the-hour maintenance package, with a high level of flexibility that makes it possible to meet a wide range of specific needs, depending on the operator’s local resources, fleet and expected operations. This maintenance agreement is part of a broader support from ATR who will be providing a full range of technical and engineering maintenance services, along with comprehensive training solutions for the airline’s flight crew, mechanics and technicians. ATR is also supporting China Airlines and its subsidiaries to set-up in-house capabilities for ATR heavy maintenance, up to C-checks. Universal Avionics Systems Corporation (UA) has completed its acquisition by Elbit Systems. As a wholly-owned subsidiary of Elbit Systems, the company will lead commercial sales in North America for Elbit Systems’ Aerospace Division’s Commercial Aviation Business Line. Boeing and the Lion Air Group announced the airline purchased 50 of Boeing's new 737 MAX 10 airplanes. The deal, valued at approximately US$6.24bn at list prices, is the largest incremental order to date of the MAX 10 variant. The order was previously listed as unidentified on Boeing's Orders & Deliveries website. The Lion Air Group was the first to put the 737 MAX 8 into service and the first to order the 737 MAX 9. Last month, the group became the first to take delivery of a 737 MAX 9, using the airplane's added capacity to launch several international routes. Rolls-Royce has announced Jackson Square Aviation as a new customer for LessorCare, the pioneering new service tailored specifically to the needs of lessors. Jackson Square Aviation will adopt LessorCare across its existing and future fleets of Trent-powered aircraft, drawing together a range of services under one simple, flexible and comprehensive framework. Rolls-Royce launched LessorCare in January with three customers. TrueNoord, the regional aircraft lessor, has closed the purchase of three Embraer E190 aircraft from GECAS. These aircraft are under lease with and operated by HOP!, the regional operator for AirFrance-KLM in France. This additional group of three regionally operated E190 aircraft adds to the significant investment in TrueNoord’s Embraer fleet under lease and increases the organisation’s portfolio to fifteen globally operated E190s, with further acquisitions in the pipeline. The purchase was partially financed under a new finance facility arranged by BNP Paribas and DVB Bank SE. Pillsbury and Stek acted as legal advisers for TrueNoord throughout the transaction. CTT SYSTEMS AB (CTT), a market leader of aircraft humidity control systems, has announced a Cair™ VIP Inflight Humidification order from Comlux Completion for one Boeing BBJ MAX 8. The BBJ MAX 8 completion will feature humidity in the entire aircraft cabin which requires support from three humidifiers. This award is CTT Systems’ 89th VIP order for Airbus ACJs/Boeing BBJs. In line with the visit of Crown Prince HRH Mohammed bin Salman to Paris, flynas the national carrier and one of the leading low-cost airlines in the Middle East, has signed an agreement with CFM International to acquire LEAP-1A engines. With a list price worth US$6.3bn (SAR 23.6bn), flynas’ agreement with one of the world’s leading supplier of commercial aircraft engines, includes the acquiring of LEAP-1A engines to power the incoming fleet of 80, A320-neo aircraft ordered by flynas, scheduled to be delivered starting from 2018. The agreement also comprises an associated long-term maintenance and service agreement for the A320 new aircraft fleet with CFM. Arago, an artificial intelligence (AI) company specializing in intelligent business process automation and AVIATAR, an integrated software platform for digital products and services in the aviation industry, are planning to work together on the progressive automation of the MRO (Maintenance, Repair and Overhaul) process. A pilot project will therefore be launched in the Base Maintenance division of Lufthansa Technik, using Arago's AI-platform HIRO™. The HIRO™ AI platform enables autonomous process automation by leveraging algorithms that apply human expertise to determine solutions, and by retaining that knowledge to solve similar new challenges. Users benefit not only from outstanding automation rates, but also from significant cost savings and the continuation of their expert knowledge. With the help of HIRO™, the planning and production expertise used for the current planning process is digitized and centralized in the pilot. This will enable the introduction of a newly automated planning approach with considerable potential for reducing the turnaround times for the entire Lufthansa Technik overhaul network. As a long-standing member of the extended Honeywell family, GKN Fokker can now provide OEM based support with Honeywell’s licensed parts and solutions for maintenance, repairs and overhaul, enabling customers to reduce turnaround time on maintenance. With this agreement, customers will benefit from first-rate experience with legacy and mature platforms and from a high standard of repairs as a licensed facility. Honeywell-equipped aircraft will receive high-quality Honeywell parts from local Fokker service centers at a competitive price, enhancing efficiency while reducing costs for operators. STG Aerospace has been selected as the supplier for the photoluminescent emergency floor path marking system across Alaska Airlines’ Boeing and Airbus fleets, as the airline begins to streamline the cabins of its Virgin America fleet. Alaska Airlines will install STG Aerospace’s next-generation saf-Tglo® SSUL photoluminescent emergency escape path marking system (EEPMS) on 116 aircraft across its retrofitted and new Boeing 737-700, MAX9 and Airbus A320 Family fleets. Alaska Airlines will also replace the electrical emergency lighting system in the Airbus fleet, a change expected to realise significant operational cost savings due to the high reliability and fail-safe nature of saf-Tglo®. The retrofit programme is due to commence in late 2018. 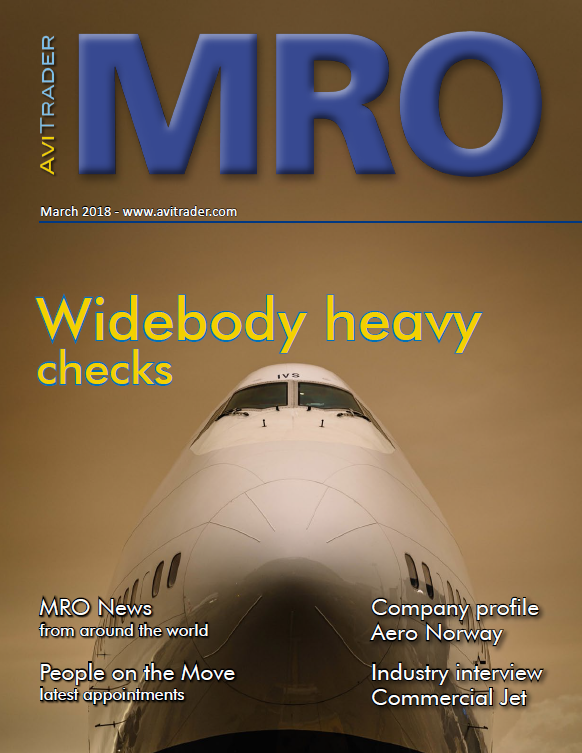 VAS Aero Services, a global leader in aviation logistics and aftermarket services, and Satair, an Airbus wholly-owned subsidiary, announced that they are expanding their strategic services agreement covering servicing, certification, warehousing and distribution of OEM excess parts inventory, with the addition of market-critical engine product types. The strategic services for used and surplus parts programs benefit Satair’s global customer base, offering a wide range of opportunities for available parts with VAS’ online parts sales platform and the Airbus Spares portal. Additionally, the agreement provides Satair customers with access to VAS-owned certified surplus new and certified serviceable / overhauled used components, and related operational support.